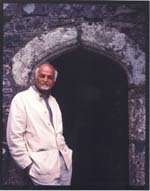 Satish Kumar is an ecological campaigner best known in recent years for the publication of the renowned bi-monthly magazine “ Resurgence”. After becoming a monk at the age of nine in India, he campaigned for land reform, working to turn Gandhi’s vision into a reality. And as a young man he undertook an 8,000 mile peace pilgrimage around the world, walking from India to America without money. Kumar is also the founder and Director of Programmes of Schumacher College - international centre for ecological studies, and is founder of the Small School in Devon. Here, Satish shares something of his life journey that he says is not so much about its destination, but rather about the evolving spiritual process - Length 43 mins.